for information (on a particular subject, keyword, author, etc.) 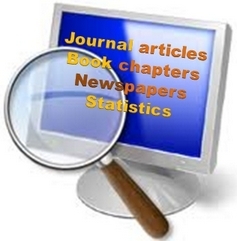 across multiple sources (journals, newspapers, etc.) simultaneously. Hence when you use a database, you are searching many sources for information on your subject matter. There are many databases subscribed by NUS Libraries, most contain journal articles from various journals, while others has other types of content. For example Factiva and LexisNexis Academic contain newspaper articles, while ARTstor is an image database. Most article databases are specialized for specific disciplines, eg EconLIT is for Economics, PsycINFO is for Psychology, though some like Scopus or Web of Science span several disciplines. Not sure which database to use? You can browse by subject or type or check out the recommended databases in subject guides compiled by our Resource Librarians. JSTOR is an example of a database that provides full-texts (usually PDF and/or html) of the articles (though not all are subscribed by NUS Libraries). Scopus, Web of Science, PubMed , Sociological Abstracts, Psycinfo, ERIC are examples of abstracting and indexing databases. They generally contain the meta-data (title, author etc) and abstract. Links to full-texts are available through clicking on our link resolver . PubMed, Psychinfo, EconLit and Engineering Village 2 cover specialized materials in specific subject areas. Scopus and the Web of Science are cross-disciplinary databases that provide useful tools for tracking the number of times an article has been cited by other works/authors. Due to the nature of scholarly communications today, where journal articles are locked up in different silos and databases, there is no one search that covers every scholarly item in the world. So what should you use? The following three search services probably cover the most resources in one search. FindMore@NUSL - The Library Discovery search service that covers most but not all of our online journals articles, books and more. Provides a reasonable amount of features for filtering and refinement of results. Google Scholar - Google's search engine that covers "scholarly material" including a lot of free or open access material but may present results you have no access to. Sometimes, more is not necessarily better, so you might want to start with a more focused subject specific database as it may be easier to find what you need, rather than looking through thousands of results. Specialised subject databases - Examples include Econlit, Pubmed, Engineering Villiage 2. The two biggest are Scopus and Web of Science - these are specialised tools for each discipline. They may cover items not found in FindMore@NUSL, Google Scholar and also offer more powerful search features specific to each discipline for filtering and refinement. As there are dozens of major databases for each topic, it is highly recommended you start with the ones recommended in our subject guides. 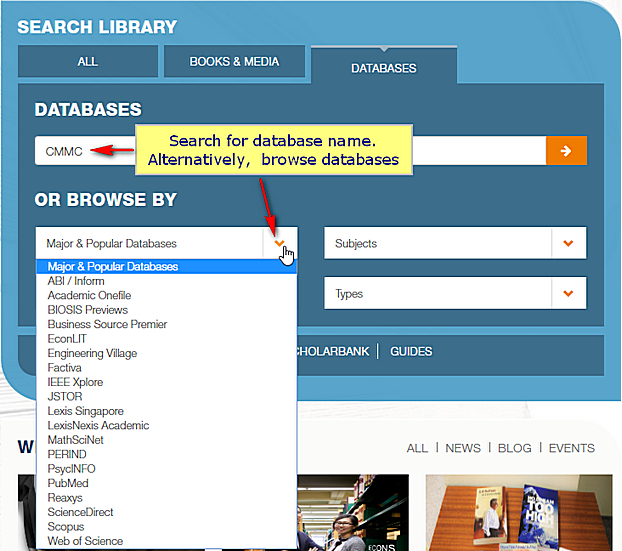 If that is not enough, you can also browse databases by discipline or browse journals by discipline. Includes all NUS Libraries' books & most online material in one search. Full-test search of many books & journal articles. Allows some refinement & filtering of results. Some online material is not included. Lacks more advanced search features for filtering & precise controlled searching compared to specialised subject databases. Need a few articles on a topic & not sure where to start. Doing cross disciplinary research, eg compare how same jargon is used across fields. Very obscure topic with few results. "Cited by" & Google Scholar alerts. Will include lots of material, you can't access unless you request for purchase via document delivery. Metadata from Google Scholar is often inaccurate . Google Scholar's definition of what is "Scholarly" is unclear. There is no confirmed list of sources covered by Google Scholar so you do not know how much of a certain Journal is included in the search. Getting full-text from Google Scholar is a bit more difficult, though the Google Scholar Library linksprogram & proxy bookmarklet help. Possibly weaker coverage in some areas like Business compared to Science or Computer Science. When you need to do a very broad search & are willing to look through lots of results. You don't mind looking at some results you can't access, or are willing to wait to request the article via document delivery. Very focused search that will only give you results from a certain discipline. Powerful search features that may allow you to get exactly what you want without looking through thousands of results. May include resources or items not found in other more general searches. Interface maybe more difficult to use. The search is very precise & often unforgiving and you usually end up with almost exactly what you want or zero results. Some of the databases will list items we have in print only, or may not be accessable unless you request for purchase via document delivery. You are comfortable with Boolean searching & need to do a comprehensive, through literature search in the area. You need a specific feature for discipline specific needs. 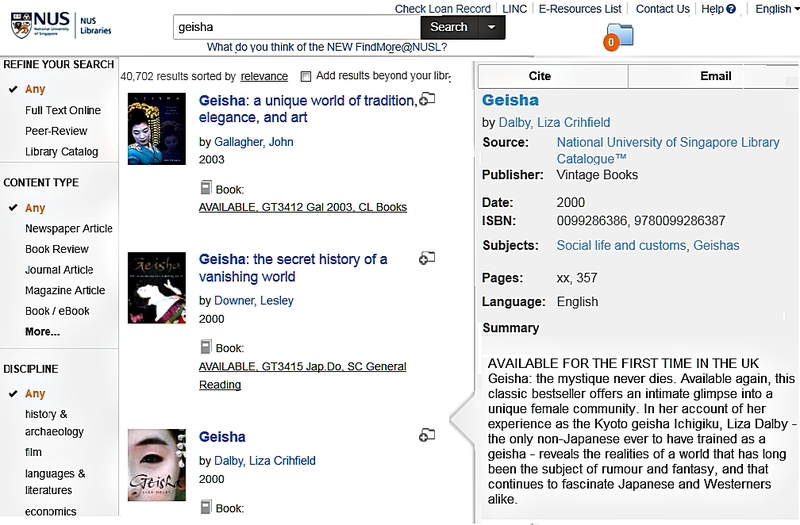 FindMore@NUSL is a new search service launched by NUS Libraries in Dec 2012. It's similar to Google Scholar (see below) in that it obtains article level data from each source directly and stores in one place, allowing you to search a large number of items with one search. On top of articles it also covers what is in our library catalogue and ScholarBank@NUS - our institutional repository which includes ETD (Electronic Theses & Dissertations). Currently as of Dec 2012, there are over 312 million items in FindMore@NUSL and rising as we add more journals. Most of the items shown will be available full text for free or via NUS Library subscriptions. Similar to Google Scholar, this service doesn't include everything NUS has access to for various reasons. One reason of which is the publisher has no arrangements with this service so we cannot add article level data into the system. Unlike Google Scholar, FindMore has more powerful filtering features like refining by subject terms, content type and the ability to refine to just items in peer reviewed journal. Also FindMore is reflective of NUS Libraries' collection and will show items you mostly have access to unlike Google Scholar. Please note that this service lists only online journal articles, so it will not find journal articles we may have in print only. For more details about this service see FAQs. Similar to FindMore@NUSL, Google Scholar is one platform which collects or harvests and/or crawl data from each publisher separately and store it at one place. Like FindMore, this allows the return of more consistent, normalized and most importantly speedy results. Please note that while Google Scholar collection is vast even Google Scholar doesn't have permission to access every publisher site and unlike FindMore@NUSL does not include our library catalogue. FindMore and Google Scholar overlaps but you may find some material in FindMore not in Google scholar or viceversa. Also be careful, not every item showed by Google Scholar is actually "scholarly". 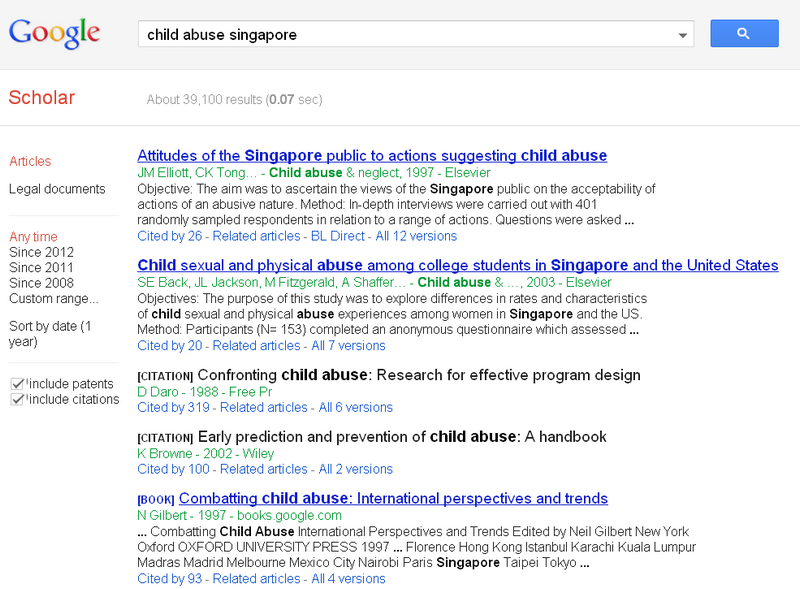 Google Scholar may also show results from Google Books but not all will be owned by NUS Libraries. It is difficult to limit Google Scholar to showing only what we have access to, we have registered with the Google Scholar Library Links programme, so you can set up your preferences to display a "Find it! with NUS Libraries" link if Google scholar thinks we have access to the online article but this isn't 100% reliable, nor does this help with books. Another way is to use the proxy bookmarklet to help check availability this can still be frustrating because you will see many results we will not have access to. Google Scholar & FindMore@NUSL tend to generate a lot of results due to the breadth and scope of the search. Although great for cross disciplinary searches or for searching for specific articles, sometimes it might be better to focus on a more specific subject related database such as EconLit , Sociological abstracts, IEEE, Philisopher's index etc. Such seaches often include articles not included in Google scholar, FindMore and/or may offer more powerful search functions specific to the discipline to allow more powerful searches to ensure you don't miss anything. Not sure which database to use? Go to the appropriate Subject Guide to check what is recommended by our librarians.